In today’s world all software developers and computer engineers continuously create a huge bundle of professional applications, standalone softwares, and smooth web applications to integrate social media sites as well as the other custom websites out there on the World Wide Web. And here is what they do while they're developing and coding those spectacular and helpful new productions, they usually set and implement some certain terms, protocols, and regulations for the usage of any specific element[software] of their production; i.e. Professional software firms like Microsoft always set and give their productions/softwares such as Microsoft Office a certain and specific trial period which gives the user a few days to use Microsoft Office without purchasing the software, that is good so far and it’s the professional way to deal with gaining some revenue from your regular users, customers, and clients while giving them a demonstration and checking time to convince them that your software is valid and your services are reliable so later on when the trial version expires they go and get your full software package by purchasing it. But what about if there are others like me and you those who don't want to purchase the software at all and the same time need to use the software forever without paying a penny, so in that case I’ve decided to give them a chance by telling them a simple technique which can help them to use any specific software of their choice for ever without worrying about the trial period. And there may be a number of different ways to use a trial version of a software for ever like using Keygens or Cracking the software which is absolutely illegal and impossible to do for a normal computer user but in this tutorial I will show and another way which is much simpler, easier and safer than all of the previous methods you’ve ever known and its to use a third party software called RunAsDate so to know how this makes any trial version of a software works for ever, just follow below steps. 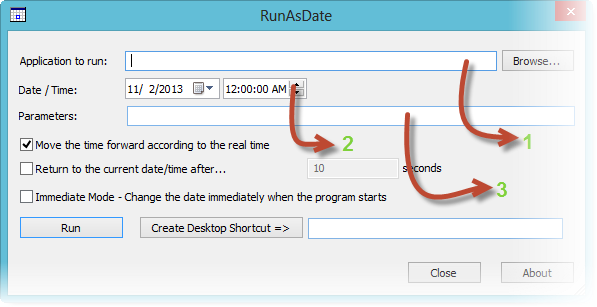 Before starting the steps let’s get tuned and review what RunAsDate software is, its definitely a small utility that allows you to run a program on the date and time that you specify. This utility doesn't change the current system date and time of your computer, but it only injects the date/time that you specify into the desired application. You can run multiple applications simultaneously, each application works with different date and time, while the real date/time of your system continues to run normally. Now let’s proceed to the steps. First of all we have to download RunAsDate software and there are two available versions one for 32bit systems and one for 64bit systems so first make sure whether your system is a 32bit or 64bit then follow along and click one of the below download links according to your system type. RunAsDate download links: for 32bit system // for 64bit systems. After clicking the download link and the download completes you’ll get a zipped file so go and unzip it by using WinRAR, WinZip, and 7zip or any other tool that you can get which can unzip the downloaded file. After unzipping the downloaded file you will get a separate three files in that file, so try to double click the one that says RunAsDate.exe or follow the below image for a better demonstration. 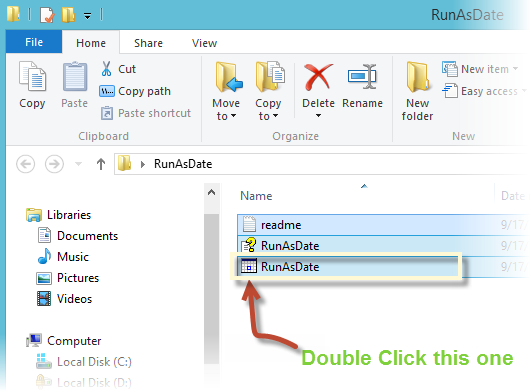 Note: RunAsDate.exe does not need any installation just double click it and it will automatically run and for now when the application launches you will have a window like the one in the below image. Now if we look deeply to the previous window we will notice that the the window consists three fields and a few checkboxes and buttons, so we are not going to use all of them for now we'll just use the first two fields the one “application to run:” and the one beneath it –for a better understanding look the below two images, and from this stage will chose our software from our PC’s installation directly by clicking the little Browse button on the top right corner of the application so click there and choose your desired trail software on your system and on the next field just specify the date you have installed the trial software you want to run forever and to do that make some guessing or if you noted earlier the date that will be much better. Note: I usually note the date of installing any trial software on a sheet or I mark it on a calendar and I recommend you to do so. Now if you have done the previous steps correctly go and click “Run” and wait a second then the application will instantly launch. And the best of is you can make a shortcut for your favorite application by just giving a name to your shortcut and click that button says “Create a desktop shortcut>>” and there you go you'll find a shortcut on your desktop so whenever you need to launch that specific software it’s not must to again launch RunAsDate and then browse your software from there, just go and click that shortcut. Congratulations now you can use almost every trial software you or you may have on your system forever, with using RunAsDate but the question is how RunAsDate software works so below I will tell you in short sentences I hope that you can catch up something from it. RunAsDate intercepts the kernel API calls that returns the current date and time (GeSystemTime, GetLocalTime, GetSystemTimeAsFileTime), and replaces the current date/time with the date/time that you specify. Yusuf is a freelancer and a friendly junior web and software developer, usually involves with the modern technology innovations and updates. Blogging and sharing bright ideas are his hobbies. Hello bro! Please write also about Time Stopper. You may useTime stopper to use trial softwareforever. Time stopper and run as date are the best software to use trial software forever. So thanks for sharing with us. 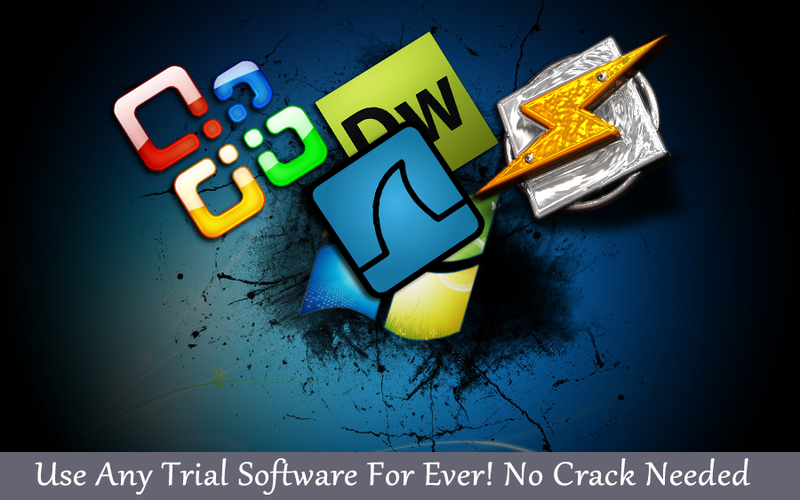 @Time Stopper, thanks for stopping by, it's the truth that "TIME STOPPER" really rocks among the other available softwares that can give you the pleasure of using trial softwares for ever, and by the way i mostly use it for my day to day tasks. and on the coming hours i will definitely write a review about it. 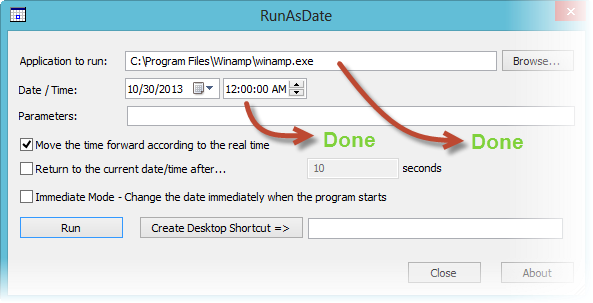 Run As Date and Time Stopper, both are popular software. Run as Date, i like most because it is a portable software. @Tony Could you please specify a little bit about what you mean by "unregistered versions" at least point a relevant example. AND on that basis i will definitely give you a more specific answer. i want to crack any antivirus, but i don't know to do it, please give me the solution please. @Riski Hatmojo; to find a cracked software no matter whether its an antivirus or any other third party software its really easy and you don't really need to know how to crack a software you can just go to GOOGLE and search the name of the software that you need, for example, if i need to find a cracked full version of the famous software "Advanced SystemCare Pro" i will go to GOOGLE and type (Download Advanced SystemCare Pro full cracked). and I am sure you will find a massive accessible links to download from. The second option is to download torrent files which are almost cracked by default from here The Pirate Bay. At last but not the least if you are somehow interested to learn how to crack softwares, that is really good and i will write a tutorial about that topic, but keep in mind cracking an antivirus software is most likely impossible because its almost secured and cannot be cracked easily. If I search an antivirus on google I never get its full cracked, just activated for temporary and than its ask a new serial. and I don't like it. I want to antivirus which full cracked for long time. I want to install Kaspersky 2014 or Bitdefender latest version. would you like to give me a Kaspersky 2014 which full cracked.?? its a good idea if you would like to write a tutorial about that. I will wait for your toturial. "Your system clock appears to have been set back, possibly in an attempt to defeat the security system on this program. Please correct your system clock before trying to run this program again. If your clock is correct, please contact the author of this program for instructions on correcting this error (report code 0,5542,5535)." Hi, Tried it but it closed the program and said it was sending a message to the company. Have you had this before and should I be concerned? it dowesn't work with Wt Fast, have anyone an idea how to crack wt fast? Nice work sir. Really appreciate this. I have tried this and it work on many of the software but it does not work for all. With The Help of Windroy Run Android Apps On PCs! How To Find Out Someone's IP-Address Without Even Asking Him? Learn By Research Network is an online hub for revealing realities and facts about technology, how things work, Inventions, Security, Software Reviews, Tips and Tricks. Not only that but also we provide pre-established projects and much more. If you are interested spreading the word of technology or inventions in particular you can join us and became a co-author by just contacting us. He started blogging earlier in 2012 on a WordPress based blog named Hanad Deer. He also runs a number of other blogs from his living room.